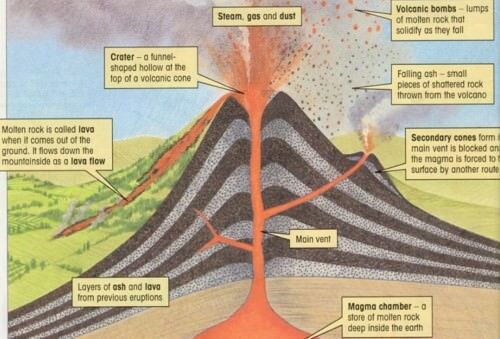 A volcano is a vent in the earth’s crust from which molten rock material (magma), explosive bursts of gases and volcanic ashes erupt..
A mountain or hill having a crater or vent through which lava, rock fragments, hot vapour, and gas are or have been erupted from the earth’s crust. A fissure vent, also known as a volcanic fissure or eruption fissure, is a linear volcanic vent through which lava erupts, usually without any explosive activity. The vent is often a few meters wide and may be many kilometers long. The chemical reactions of radioactive substances deep within the interior of the earth generate tremendous amount of heat. Some heat is already present in the form of residual heat (heat captured at the center during earth’s formation) is already present at the earth’s interior. There is a huge temperature difference between the inner layers and the outer layers of the earth due to differential amount of radioactivity. This temperature difference gives rise to convectional currents in the outer core as well as the mantle. The convectional currents in the mantle create convergent and divergent boundaries. At the divergent boundary, molten, semi-molten and sometimes gaseous material appears on earth at the first available opportunity (the best available weak zone – usually a plate margin). The earthquakes may expose fault zones through which magma may escape (This happens in fissure type volcano). At the convergent boundary, the subduction of denser plate creates magma at high pressure which will escape to the surface. 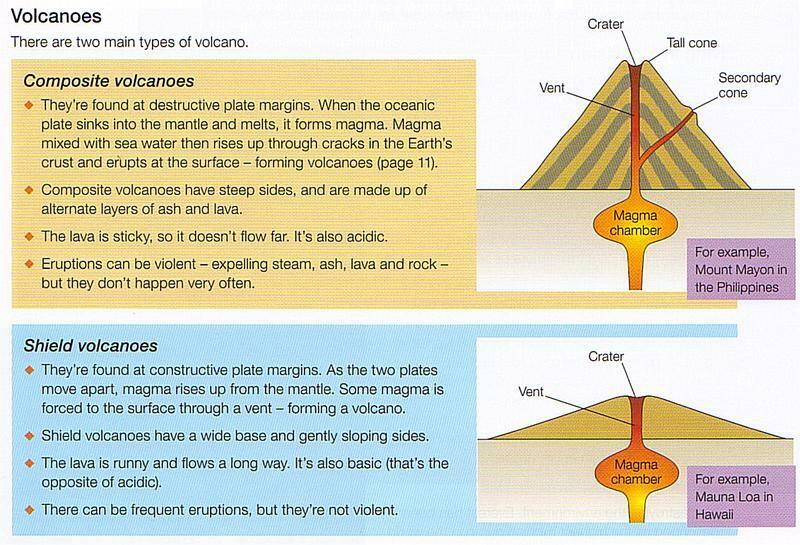 Because of high pressure, the magma and gases escape with great velocity as the pressure is released through eruptions. These lavas are highly viscous with a high melting point. They are light-colored, of low density, and have a high percentage of silica. They flow slowly and seldom travel far before solidifying. The resultant cone is therefore steep sided. The rapid solidifying of lava in the vent obstructs the flow of the out-pouring lava, resulting in loud explosions, throwing out many volcanic bombs or pyroclasts. Sometimes the lavas are so viscous that they form a spine or plug at the crater like that of Mt. Pelee in Martinique. These are the hottest lavas, about 1,000°C. (1,830°F.) and are highly fluid. They are dark colored like basalt, rich in iron and magnesium but poor in silica. They flow out of volcanic vent quietly and are not very explosive. Due to their high fluidity, they flow readily with a speed of 10 to 30 miles per hour. They affect extensive areas, spreading out as thin sheets over great distances before they solidify (This is how Deccan Traps were formed). The resultant volcano is gently sloping with a wide diameter and forms a flattened shield or dome. Volcanism can be a greatly damaging natural disaster. The damage is caused by advancing lava which engulfs whole cities. Showers of cinders and bombs can cause damage to life. Violent earthquakes associated with the volcanic activity and mudflows of volcanic ash saturated by heavy rain can bury nearby places. Sometimes ash can precipitate under the influence of rain and completely cover whole cities. In coastal areas, seismic sea waves (called tsunamis in Japan) are an additional danger which are generated by submarine earth faults where volcanism is active. The volcanic gases that pose the greatest potential hazard to people, animals, agriculture, and property are sulfur dioxide, carbon dioxide, and hydrogen fluoride. Locally, sulfur dioxide gas can lead to acid rain and air pollution downwind from a volcano. Volcanism creates new landforms like islands, plateaus, volcanic mountains etc. The volcanic ash and dust are very fertile for farms and orchards. Volcanic rocks yield very fertile soil upon weathering and decomposition. Although steep volcano slopes prevent extensive agriculture, forestry operations on them provide valuable timber resources. Mineral resources, particularly metallic ores are brought to the surface by volcanoes. Sometimes copper and other ores fill the gas-bubble cavities. The famed Kimberlite rock of South Africa, source of diamonds, is the pipe of an ancient volcano. In the vicinity of active volcanoes, waters in the depth are heated from contact with hot magma giving rise to springs and geysers. The heat from the earth’s interior in areas of volcanic activity is used to generate geothermal electricity. Countries producing geothermal power include USA, Russia, Japan, Italy, New Zealand and Mexico. The Puga valley in Ladakh region and Manikaran (Himachal Pradesh) are promising spots in India for the generation of geothermal electricity. Geothermal potential can also be used for space heating. As scenic features of great beauty, attracting a heavy tourist trade, few landforms outrank volcanoes. At several places, national parks have been set up, centered around volcanoes. As a source of crushed rock for concrete aggregate or railroad ballast, and other engineering purposes, lava rock is often extensively used. Almost all the world’s geysers are confined to three major areas: Iceland, New Zealand and Yellowstone Park of U.S.A.
Iceland has thousands of hot springs. Some of them have been harnessed to heat houses, swimming pools and for other domestic purposes. Hot springs and geysers have become tourist attractions e.g. in Japan and Hawaii. Water that percolated into the porus rock is subjected to intense heat by the underlying hard rock which is in contact with hot magma in the mantle or the lower part of crust. Under the influence of intense heat the water in the capillaries and narrow roots in the porous rock undergoes intense expansion and gets converted to steam resulting in high pressure. When this steam or water at high pressure finds a path to the surface through narrow vents and weak zones, appear at the surface as geysers and hot water springs. 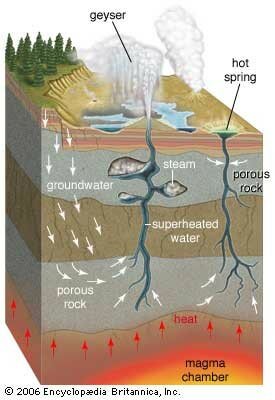 Steam or water at high pressure, along its path, gets accumulated in small reservoirs, fissures and fractures. Once the pressure exceeds the threshold limit, the steam bursts out to the surface disrupting the water at the mouth. Hence the name geyser. Usually a carter like structure is created at the mouth. Found in very few regions. Iceland is famous for its geysers. Steam or water at high pressure smoothly flows to the top through the vent and condense at the surface giving rise to a spring. Usually a carter like structure is created at the mouth of the spring. Some springs are very colorful because of the presence of cyanobacteria of different colors. Since the 16th century, around 480 volcanoes have been reported to be active. Of these, nearly 400 are located in and around the Pacific Ocean and 80 are in the mid-world belt across the Mediterranean Sea, Alpine-Himalayan belt and in the Atlantic and Indian Oceans. The belts of highest concentration are Aleutian-Kurile islands arc, Melanesia and New Zealand-Tonga belt. Only 10 per cent to 20 per cent of all volcanic activity is above sea and terrestrial volcanic mountains are small when compared to their submarine counterparts. Most known volcanic activity and the earthquakes occur along converging plate margins and mid-oceanic ridges. There is a strikingly close agreement between volcanic and earthquake zones of the earth. Circum-Pacilic region, popularly termed the ‘Pacific Ring of Fire’, has the greatest concentration of active volcanoes. Volcanic belt and earthquake belt closely overlap along the ‘Pacific Ring of Fire’. ‘Pacific Ring of Fire’ is estimated to include two-thirds of the world’s volcanoes. Pacific islands of Solomon, New Hebrides, Tonga and North Island, New Zealand. Andes to Central America (particularly Guatemala, Costa Rica and Nicaragua), Mexico and right up to Alaska. It is said that there are almost 100 active volcanoes in the Philippines, 40 in the Andes, 35 in Japan, and more than 70 in Indonesia. In contrast, the Atlantic coasts have comparatively few active volcanoes but many dormant or extinct volcanoes, e.g. St. Helena, Cape Verde Islands and Canary Islands etc.. But the volcanoes of Iceland and the Azores are active. In Africa some volcanoes are found along the East African Rift Valley, e.g. Kilimanjaro and Mt. Kenya, both probably extinct. The only active volcano of West Africa is Mt. Cameroon. There are some volcanic cones in Madagascar, but active eruption has not been known so far. The West Indian islands have experienced some violent ex­plosions in recent times. E.g. Pelee. The Lesser Antilles (Part of West Indies Islands) are made up mainly of volcanic islands and some of them still bear signs of volcanic liveliness. Volcanoes of the Mediter­ranean region are mainly associated with the Alpine folds, e.g. Vesuvius, Stromboli (Light House of the Mediterranean) and those of the Aegean islands. A few continue into Asia Minor (Mt. Ararat, Mt. Elbruz). The Hima­layas have, surprisingly, no active volcano at all. The volcanism of this broad region, stretching from Spain to the Caucasus, is largely the result of convergence between the Eurasian Plate and the northward-moving African Plate. 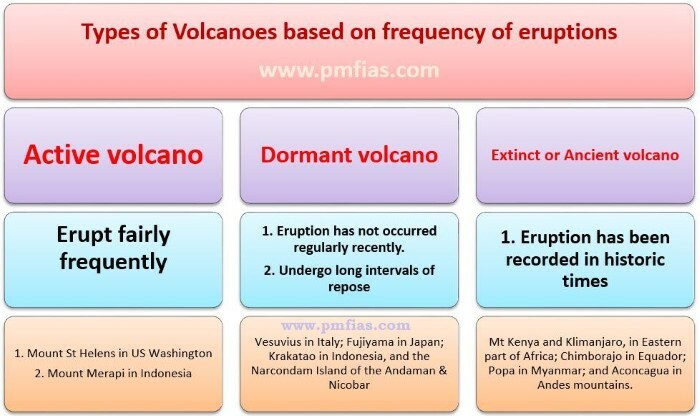 This type of volcanism is mainly due to breaking up of Mediterranean plate into multiple plates due to interaction of African and Eurasian plate. Elsewhere in the interiors of continents—Asia, North America, Europe and Australia, active volcanoes are rare. There are no volcanoes in Australia. The world’s distribution of earthquakes coincides very closely with that of volcanoes. 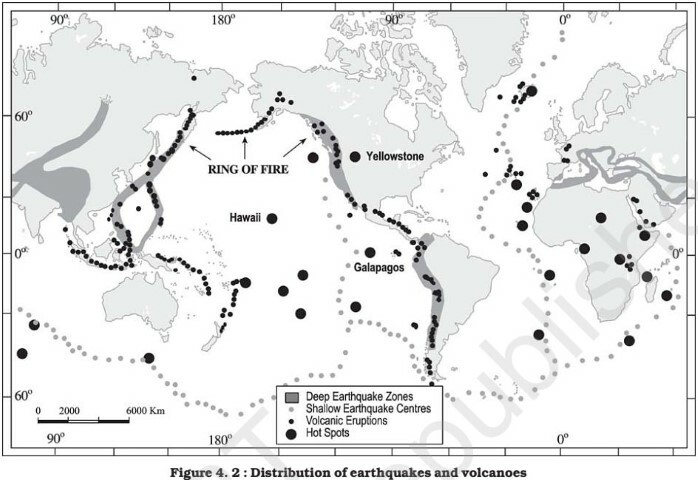 Regions of greatest seismicity are Circum-Pacific areas, with the epicentres and the most frequent occurrences along the ‘Pacific Ring of Fire. It is said that as many as 70 per cent of earthquakes occur in the Circum-Pacific belt. Another 20 per cent of earth­quakes take place in the Mediterranean-Himalayan belt including Asia Minor, the Himalayas and parts of north-west China. Elsewhere, the earth’s crust is relatively stable and is less prone to earthquakes, though nowhere can be said to be immune to earth tremors. There are no volcanoes in the Himalayan region or in the Indian peninsula. Barren Island, lying 135 km north-east of Port Blair became active again in 1991 and 1995. After its activity in the nineteenth century, it passed through a mild solfataric stage as evidenced by the sublimations of sulphur on the walls of the crater. The other volcanic island in Indian territory is Narcondam, about 150 km north-east of Barren Island; it is probably extinct. Its crater wall has been completely destroyed. Before a volcano becomes extinct, it passes through a waning stage during which steam and other hot gases and vapours are exhaled. These are known as fumaroles or solfataras. The Barren Island in the Andaman and Nicobar Islands of India, Vesuvius (Italy) and Krakatao (Indonesia) which were thought to be extinct, erupted recently and stayed active for few years and are now in dormant stage. Krakatao volcano became active in 1883, killing 36,000 people in West Java. Today, Krakatao is no more than a low island with a caldera lake inside its crater. In the history of mankind perhaps the most disastrous eruptions were those of Vesuvius, Mt. Krakatau and Mt. Pelee. Vesuvius is a Stratovolcano (composite volcano) in Italy. Vesuvius, standing 4,000 feet above the Bay of Naples, erupted violently in A.D. 79. The city of Pompeii, located to the south-west, was buried beneath twenty feet of volcanic ashes cemented by the torrential downpours of heavy rain. Fertility of the solidified Volcanic ashes tempted many farmers to begin anew on the slopes of Vesuvius. Then came the catastrophic eruption of December 1631, ruined fifteen towns and killed inhabitants. The greatest volcanic explosion known to men is perhaps that of Mt. Krakatau in August 1883. Krakatau is a small volcanic island in the Sunda Straits, between Java and Sumatra. The explosion could be heard in Australia, almost 3,000 miles away. Though Krakatau itself was not inhabited and nobody was killed by the lava flows, the vibration set up enormous waves over 100 feet high which drowned 36,000 people in the coastal districts of Indonesia. The eruption of Mt. Pelee of the West Indies in May 1902 was the most catastrophic of modem times. Pierre, the capital of Martinique, lying on the path of the lava, was completely destroyed within minutes. Its entire population of 30,000 was killed almost instantly.